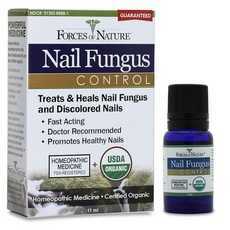 Enjoy Forces Of Nature Nail Fungus Control. Nail Fungus Control Is An Fda Registered Medicine To Treat Nail Fungus And Approved For Over The Counter Sales. It Is The World?S First Certified Organic Nail Fungus Treatment. It Is Pharmaceutical Strength And Doctor Recommended. It Works Time After Time, Results Are Often Seen In Days. This Treatment For Nail Fungus Represents A Revolutionary Advancement In The Fight Against Nail Fungus. Its Therapeutic Agents Deliver A Pronounced Healing Effect Against Infected Nails. It Is Approved For Over The Counter Sales And Doctor Recommended. This Treatment For Nail Fungus Is One-Of-A-Kind As It Features Our Famous Dual Modality Approach To Healing. It Combines Certified Organic Homeopathic Medicines To Combat Nail Fungus And Key Botanicals To Sooth Damaged Skin Tissue. These Added Botanicals Expand And Support The Action Of The Homeopathics. This Is A Proprietary Formula Manufactured And Distributed Only By Forces Of Nature. The Homeopathic Agents Contain A Multitude Of Bioactive Constituents, Including Proanthocyanins, Flavonoids, Biflavonoids, Xanthones, Phenylpropanes. The Soothing Botanicals Contain A Broad Spectrum Of Phenolic Compounds. The Lipophilic Formula Absorbs Deep Into Skin Tissue, Where It Works On A Cellular Level To Effectively Treat Nail Fungus And Help Promote Healthy Skin Tissue. (Note: Description is informational only. Please refer to ingredients label on product prior to use and address any health questions to your Health Professional prior to use.